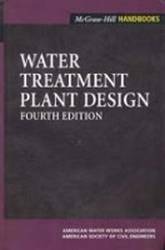 The fourth edition of this engineering design classic is your total reference on water treatment plant upgrades or new construction. From initial plans and permits, through design, construction, and startup, this reference is a must for every designer and plant manager. Chapter topics include: Design and Construction, Intake Facilities, Hydraulics, Process Residuals, Architectural Design, Structural Design, Design Reliability Features, Site Selection and Plant Arrangements, Environmental Impact and Project Planning, Construction Goals, Operator Training and Plant Startup and Pilot Plant Design and Construction.